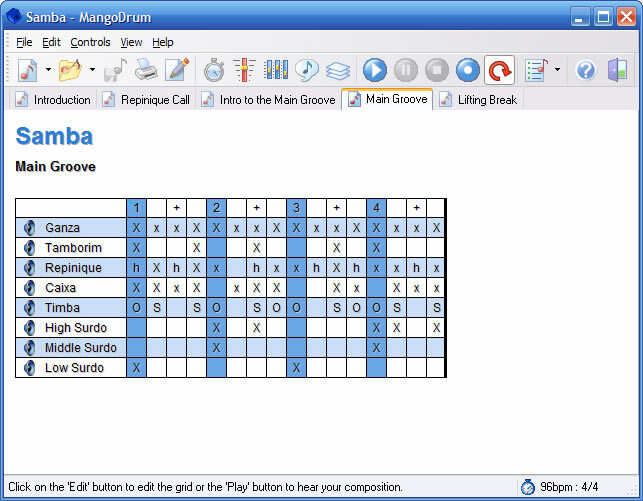 Mangodrum is a very simple to use percussion composer program for Windows which uses an easy to understand grid format for displaying the rhythm patterns. These compositions can then be played, recorded to MP3 files or saved as a PDF file.Each composition can consist of a range of instruments with options to only listen to the selected instrument or the whole band. A playlist is used to bring together all the sections in your composition. ...... The balance and volume of each instrument can be changed to fine tune the sound of your 'band' with instruments being easily created or downloaded from our web site. A playlist is used to bring together all the sections in your composition to create your final piece. Qweas is providing links to Mangodrum 2.3.1.00 as a courtesy, and makes no representations regarding Mangodrum or any other applications or any information related thereto. Any questions, complaints or claims regarding this application Mangodrum 2.3.1.00 must be directed to the appropriate software vendor. You may click the publisher link of Mangodrum on the top of this page to get more details about the vendor.